Join our community. Put "I like" on our new Facebook page. New graphics and new content. Not just entertainment but so much (in) training. 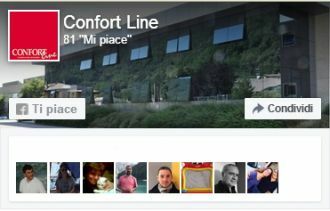 Stay connected with the Confort Line world, join our community and discover new products, watch videos and product information, find industry trends and design innovations. And when a sofa manages to be nice and comfortable, it has already said a lot. But we did not settle for these 2 qualities, although decisive for the success of a sofa, we took care of the details with meticulous care, because the sofa could really express all the qualities that belong to a product of excellence. Many details really make the difference, some small important details decided in the design phase and very effective technical solutions, lead to a perfect aesthetic result and benefits in terms of practicality of use really extraordinary. A commitment of the Company to guarantee quality, maximum efficiency and maximum durability. Let's go into the details of the design and at the end we compare the technical characteristics of our products with those generally offered on the market. 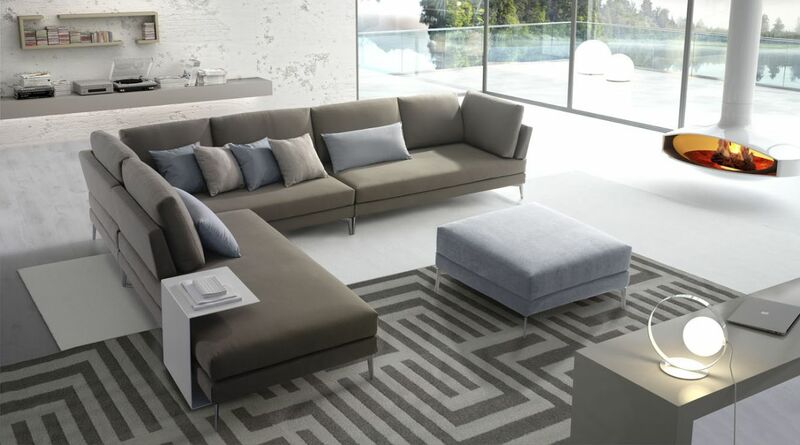 It is 2 modern sofas, with a very modern design, able to adapt perfectly to multiple styles of furniture. They are extraordinarily proportionate! The width of the armrest, the height of the backrest, the size of the seat are in perfect harmony and allow people of different sizes and builds an optimal posture. Raised from the ground by a good 13 cm. they are impressed by the visual lightness and fluidity that sofas of such important dimensions can hardly express. Both have a well-finished metal foot, solid, load-bearing, thin but with a sufficiently wide base and a terminal protection to protect intense use even on delicate floors. They are equipped with headrests and use a mechanism with great performance and reduced overall dimensions. This is not the common ratchet but an extremely versatile headrest mechanism in use. Wheel of 108 °, has a lift of 160 mm and a translation of 62 mm allowing both TV positions and Relax position. It is available in both manual and electric versions. We recommend the electric headrest in the relax version as with the relaxation seat in maximum extension the greater cervical support allows to maintain a correct posture and to use the product in complete comfort. The motors of the headrest and of the relax are not bound by a synchronized opening, but they are 2 separate and perfectly independent electric motors. They can be operated by means of 2 separate controls (placed on the seat) and this allows you to freely choose the desired position. By pressing the 'sitting' command key and the 'headrest' command button, we can adjust the backrest and footboard in all positions. Infinite combinations to satisfy the most comfortable and desired position at that precise moment. No constraints but full autonomy. For a correct use we just have to remember to raise the headrest first and then activate the relax of the session. We use the same mechanism in both models. It is an evolved, subtle mechanism with a guaranteed capacity of 150 kg and tested for over 30,000 openings. It has a 'zero-wall' opening that translated means this: you do not need to move the sofa away from the wall to operate the mechanism. 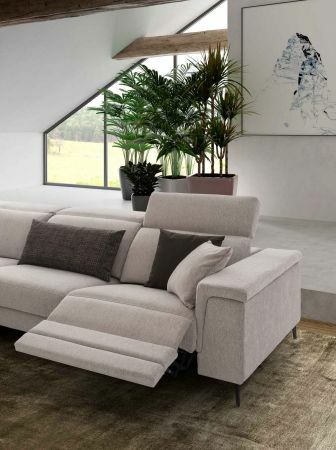 Thanks to an additional flap of the latest design, the mechanism ensures a greater extension of the seat and a more balanced design because the flap has the same size of the footboard and is aesthetically very pleasant. We have designed a spacious seat and decided only for the electric opening. We have excluded manual opening because it is impractical and less efficient as it does not allow the infinite relaxing positions of the electrical regulation. It is available in 3 different sizes. The structure of the mechanics and the particular construction of the seat cushion, allow the use of relaxation with a continuous and correct support of the legs, with no gaps between the seat and the footboard open. 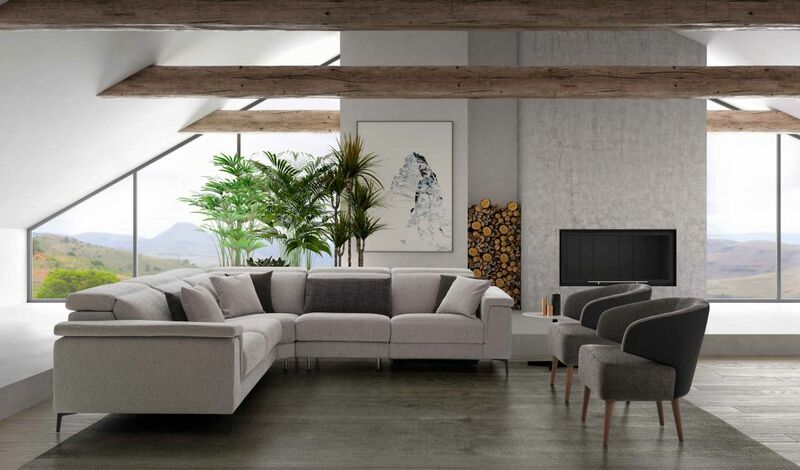 The proposal of sofas is enriched with new models with a refined and decently modern taste.